I love cookery books, but I have to confess to being a bit of a cookery book snob. Book after book appear, but many are so boring and so repetitive. To make it onto my bookshelves a cookery book has to offer me something new, something exciting and something a little different. I love books that are beautifully photographed, books that tell a story or promote a country and its traditions and now I have found a book that has totally rocked my world. Bit of an over statement you may think, but no, I have fallen head over heels in love with this book. Amber Roses’ book ‘Love Bake Nourish’, completely fills all my baking needs, it is such a stunning book, the photography is beautiful and the recipes are truly inspiring. Amber moves away from the same old, same old, of flavour combinations and ingredients and instead introduces us to a much more natural and nourishing way of baking, after all, we all love cake, so why not use ingredients when they are at their peak, in season and ingredients that are just that little bit better for us. For example, did you know that by using maple syrup in your baking instead of nasty harsh refined sugars, not only does it have fewer calories, but it also contains manganese, zinc and natural antioxidants that are good for your immune system and provides slow releasing energy. I bake nearly every day for my family, one of the reasons being so that I know exactly what they are eating and so avoiding nasty chemicals that a lot of shop brought produce is full of. I don’t want food that is filled with E this and E that, I don’t care that it will be a brighter colour or last for days, it never stays around long enough anyway! 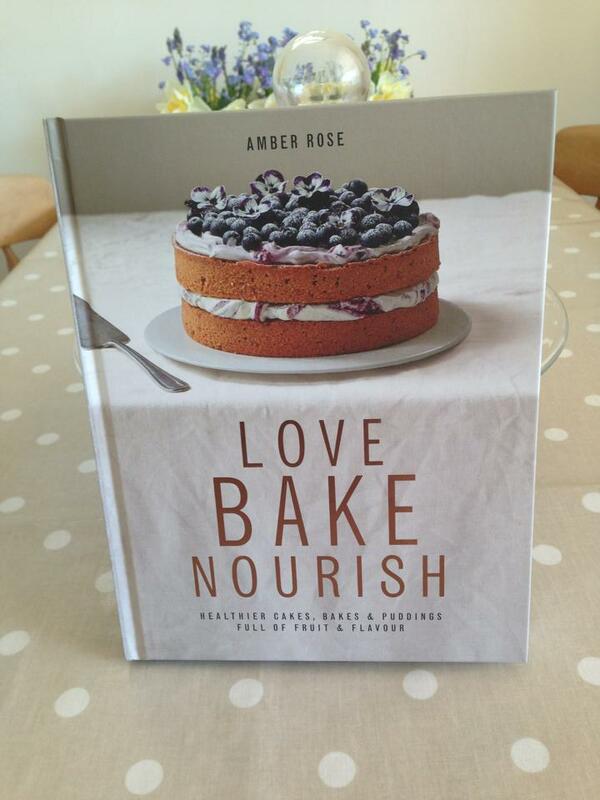 I want good wholesome, nourishing food that my family will enjoy and ‘Love Bake Nourish’ delivers this in bucket loads. Using amazing ingredients like spelt flour, maple syrup, etc, it is never going to be cheap, but the taste does make it all worth while. 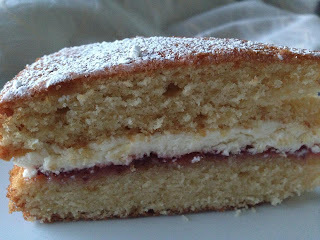 This spelt flour victoria sponge was light and fluffy, but with a slight nutty taste and a very delicate hint of the maple syrup coming through, it was also so simple to make. So if you only buy one new cookery book this year, make it this one, I promise, you will not regret it. I have not been asked by Doves Farm or Amber Rose to promote their products/book and I hope they don’t mind me using it for this post, but I just wanted to tell you all about it. Please note that Amber uses fairly small baking tins for this recipe, I used my normal size ones, it just meant it was a little thinner than I would of liked. 3 tablespoons of your favourite jam, if like me you always have a fridge full of homemade jam it is nice to get it used up before the fruit patch bursts back into life! 150ml double cream, whipped & I always add a tablespoon of icing sugar to sweetened it. Fresh flowers, petals or crystallised petals/flowers of your choice and that are in season. Grease and line 2 x 16cm loose bottomed baking tins. Divide the mixture evenly between your prepared tins, level with a palette knife and bake in the oven for about 25 minutes or until the centres spring back to the touch. Remove from the oven and leave to cool for about 5 to 10 minutes, then turn them out onto a wire rack to cool completely. 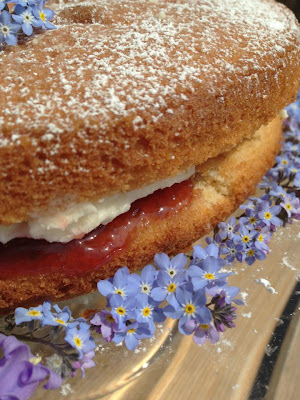 When the cakes are cooled, place one layer onto a serving plate or stand, spread with the jam, then spread the cream over the other cake and sandwich the two together. Dust with icing sugar and scatter with your chosen flowers or petals. Now all you have to do is put the kettle on, make a nice cup of tea and enjoy.